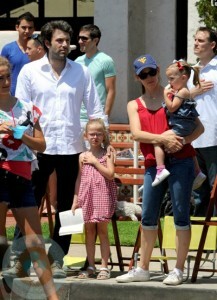 Home » Jennifer Garner Pregnant With Baby #3! Exciting news for Ben Affleck and Jennifer Garner! It was revealed tonight that the celebrity couple is expecting their third child. In just a one sentence statement to the AP, Jen and Ben said they are “thrilled” to have another baby on the way. The news of the pregnancy couldn’t come at a better time. Jen recently wrapped the majority of filming for The Odd Life of Timothy Green in Atlanta, Georgia, and she has also finished shooting Butter, in which she stars alongside Olivia Wilde, Hugh Jackman, and Alicia Silverstone. The new baby will join the couple’s two children – Seraphina,2 and Violet, 5. They seem like such a nice family and very down to earth. They must be so excited for the great news.